On Wednesday, WSVN aired a cell phone video reportedly taken moments before caregiver Charles Kinsey was shot by North Miami police. 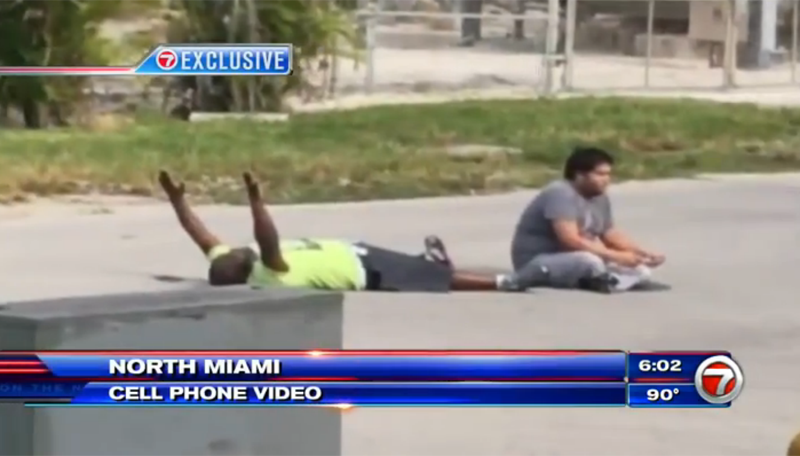 In it, Kinsey, who survived, can be seen lying on the ground with his hands raised, explaining that he and the autistic man he was assisting are unarmed. According to police, officers were dispatched to the scene of the shooting on Monday after getting a 911 call about a man with a gun threatening suicide. According to WPLG, police later said the autistic man “had something in his hand.” In the video, Kinsey can be heard identifying the object as a toy truck. After shooting him, Kinsey says police put him in handcuffs. North Miami Police say the officer who shot Kinsey has been placed on administrative leave, but have not released the officer’s name or said if he will face any charges.